Viewing the department store holiday window displays is a fun way of getting into the holiday spirit in the city. 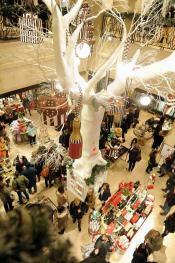 For many, many years these vendors have set up displays that are more than just celebrations of the season. Many of them are theatrical art installations that tell stories in ornately crafted settings that are both fascinating and magical. As long as you are not tempted to go in and buy something, they are also free for all on-lookers. Like all things in New York City during the month of December, these displays are very crowded. If you want to beat the tourists and crowds, go during off-peak times and not on the weekends. Many times, you won’t be able to fully appreciate and see each window, as you’ll be rushed along. Because of the crowds and lines that pass by the windows, it’s best to pack light and bring a smaller stroller. Most of these displays are up until the first week of January. Some of these displays go all out in terms of filling spectators with holiday spirit, while others are geared more towards showcasing their store’s products. Obviously, your kids will be more enticed by the former. SantaCon is Saturday, December 12th this year. For those of you who have not been in the city during this event, it is a bar crawl through mid-town chalk full of drunken people dressed as Santa and other Christmas characters. You might want to pick another date to see the window displays. Trust me. Celebrating the 50th anniversary of the Christmas classic and the return of America’s favorite “blockhead,” Macy’s presents a “Charlie Brown Christmas” theme. The six windows each depict famous scenes from the beloved television program. Of all the displays this year, this may be your younger kids’ favorite. So perhaps it would be best to start here. “A Few of Our Favorite Things” is the theme of this store’s windows. And if you have a sweet tooth, this might be a bit of an understatement. Featuring fully animated scenes inspired by candies and other goodies, dancing gingerbread men and a Parisian bakery shop highlight Lord & Taylor’s display. This year’s theme is “The Winter Palace,” with extravagant displays of various famous settings through out the world coated in ice and snow. A snowy Great Wall of China, Roman Coliseum and Great Barrier Reef are the highlights. The store’s front will also be coated in a “wintry” theme as well. Saks regularly has a immense light show on their storefront which is great to see during the evening hours. As imaginative as it is elegant, the focus of this store is Swarovski crystal, celebrating its 120th anniversary. Each display is bedazzled with the famous crystal maker’s wares. Though your kids may not find these displays as impressive as you, they are beautiful. The holiday decorations here incorporate both the outside window displays and interior decorations, tying them all together with a Parisian apartment theme. With their retro-inspired Bendel girl illustrations throughout, the decorations showcase the stores product rather than telling any kind of Christmas or winter related theme. Not to be outdone by the other stores on this list, Barney’s has installed a giant ice locker, where spectators can watch live ice sculpture carvings. Sculptors will begin at noon on each day and continue carving until the early evening hours. This attraction will end New Year’s Eve. Two other permanent non-ice displays will also be part as well. Featuring elaborate floral decorations and mirrored sculptures, the focus of Bloomingdale’s displays are the five senses of the holiday season. The windows will feature oversized peppermint candies, fluffy snowmen and a twisted fantasy pine forest. It’s perhaps a little more “artistic” for younger tastes, but quite impressive nonetheless. 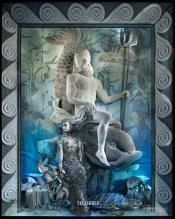 New York’s iconic jewelry store windows will house 19th century inspired dioramas. Miniature theatrical stages, using a wintry color palate of Tiffany Blue, showcase fairy-tale inspired scenes. During the evening, a light show, inspired by the store’s display at the 1939 World’s Fair, will play on the store’s facade. Featuring over 60,000 LED lights and weighing closing to 1,000 pounds, Bulgari’s New York Flagship store is wrapped in a giant recreation of their Diva necklace. This is best seen in the night times and because of it’s enormous scale, you don’t have to be right up close to the store front to get a great view.